When Harrison Hasenpusch was younger he told his dad that he didn't want to go through the process of becoming an Eagle Scout. Now he's glad that his father made him do it. "I owe a lot of that to him," Hasenpusch said. So do a lot of other people. 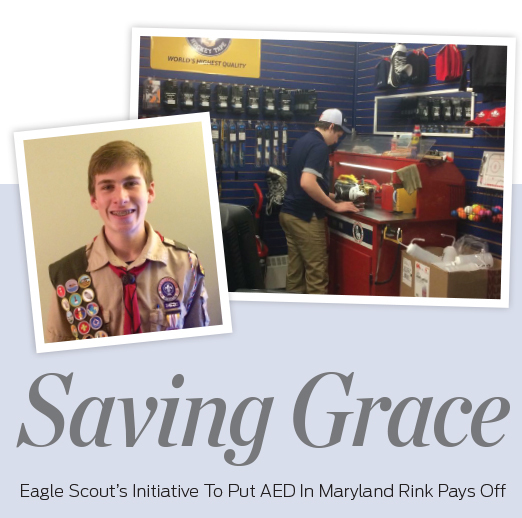 Thanks to Hasenpusch, the Piney Orchard Ice Arena in Odenton, Md., received an automated external defibrillator, or AED for short, in 2015. And it didn't take long to be put to good use. In fact, in the past three years it has already been credited with saving lives on three separate occasions. "Everything happens for a reason and I definitely think that me becoming an Eagle Scout happened for that reason," Hasenpusch said of the community service project that was part of his Scouting requirements. Playing for the Metro Maple Leafs as a youngster, Hasenpusch, now 21, noticed a lot of rinks he played in had an AED on hand, but his home rink did not. That all changed on Aug. 22, 2015, when he organized a CPR and AED training day that was attended by more than 20 people. As part of the program, a local AED company, Rescue One Training For Life, donated a unit to the Nelson Youth Hockey Association. Over the years, AEDs have been a cost effective and user-friendly way to save a life. When a person goes into cardiac arrest, the electrical activity in the heart is thrown into chaos. The AED is designed to shock it back into proper working order. And time being of the essence, it's important to perform the procedure quickly, which is why it's important to have AEDs readily accessible in public places. One of those who directly benefitted from Hasenpusch's actions is John Goodwin, an adult hockey player who suffered a heart attack during a hockey game in March 2018. Without the quick actions of his teammates and the accessibility of an AED at the rink, this father of two may not be here today. "I have spoken to many medical providers who have indicated that even with CPR alone, in my case, I may not have survived," Goodwin said. "The shock to the heart from the AED enabled my blood to flow and that, coupled with the fast actions of my teammates in providing immediate CPR and retrieving the AED, is the reason I survived." A few weeks after being released from the hospital, Goodwin and his family threw a party to thank those who helped save his life. They even made T-shirts for those who performed CPR and applied the AED that read, "This is what a hero looks like." "I am back to playing hockey, coaching my son's travel team, and coaching a women's hockey team," he said. "Most importantly, I am back to doing what I love most, and that's being a dad." As for Hasenpusch, he passes the AED each day on his way into the pro shop where he works. It's not lost on him what his initiative did, and the lives it's saved. Even though his Eagle Scout days are behind him, Hasenpusch isn't done making an impact on others' lives through his efforts. He is currently volunteering at his local fire department with his sights set on one day becoming a full-time firefighter. 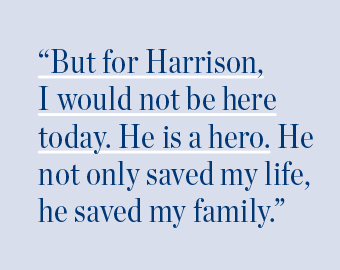 "But for Harrison, I would not be here today. He is a hero. He not only saved my life, he saved my family," Goodwin said. "I was already familiar with Harrison from him working in the pro shop, but now when I see him I have nothing but gratitude."